ON Semiconductor has added a ready-to-use 6 x 8 x1.46 mm System-in-Package (SiP) module to its family of RSL10 Bluetooth 5 radio modules. 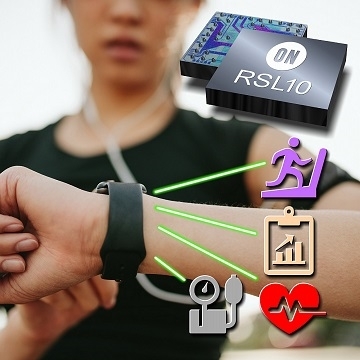 Supporting Bluetooth low energy wireless profiles, RSL10 devices can be easily designed into any ‘connected’ application including sports / fitness or mHealth wearables, smart locks and appliances. The RSL10 SIP features a built-in antenna, RSL10 radio, and all required passive components in one complete, miniature solution. Certified with the Bluetooth Special Interest Group (SIG), it significantly reduces time-to-market and development costs by removing the need for any additional RF design considerations. With the two megabits per second (Mbps) speeds possible with Bluetooth 5 alongside the industry’s lowest power consumption, the RSL10 family provides advanced wireless functionality without compromising battery application life. RSL10 consumes just 62.5 nanowatts (nW) while in Deep Sleep mode, and 7 milliwatts (mW) peak receive power. RSL10’s energy efficiency was recently validated by the EEMBC’s ULPMark where it became the first device in the benchmark’s history to break 1,000 ULP Marks and produced Core Profile scores more than twice as high as the previous industry leader. The RSL10 SIP is offered in a 51-pin 6 x 8 x 1.46 mm package. Designers can order samples or an Evaluation Board by contacting their local ON Semiconductor sales representative or authorized distributor.